Back in the 1870's, the 12 gauge was invented and became the most popular shotgun in the United States. With its extensive military, law enforcement, clay target shooting, hunting, and self defense use all over the world, it is no surprise that the 12 gauge became so loved. This phenomenal shotgun has more energy and can put out more lead than almost any other firearm, making it the king of close range firearm use. 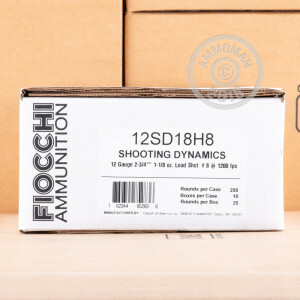 As the oldest firearms and ammunition manufacturer in Italy, Fiocchi has gained worldwide respect. 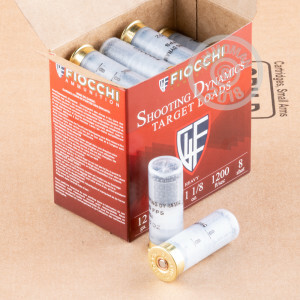 As one of the best manufacturers in the world, Fiocchi makes the incredible accurate and effective ammunition you need. 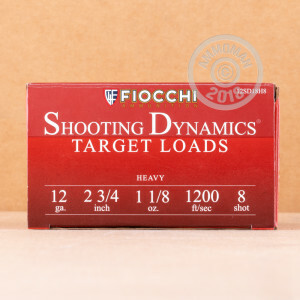 When you use these Fiocchi Heavy Target Shooting Dynamics, 2 3/4", 1 1/8 ounce, #8 shot shells, you will experience the hard hitting tight pattern that this ammo provides, perfect for blasting clay targets out of the sky.